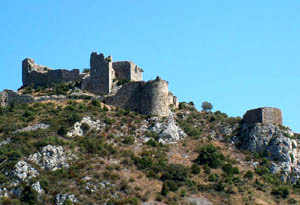 The Château d'Aguilar is a 12th century Cathar castle located in the commune of Tuchan in the Aude département of France. In 1210 it was seized and occupied by Simon de Montfort, whose soldiers held the owner Raymond de Termes in prison in Carcassonne. Militarily, the castle lay dormant for the next 30 years, until Raymond's son Olivier de Termes won back the castle in the brief revolt by the young Viscount Trencavel against the crusaders. 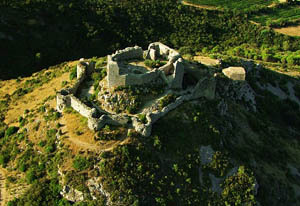 Aguilar became the refuge of faidits, Cathar knights and lords dispossessed of their own strongholds. Since 1949, it has been listed as a monument historique by the French Ministry of Culture. Today it is in poor condition, and can be visited by the public. There is no entry fee. 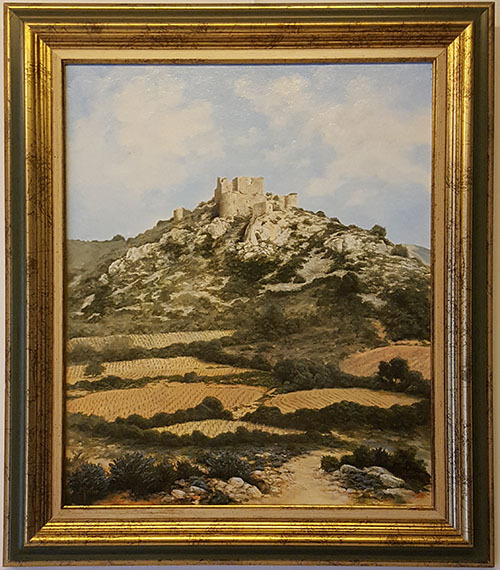 This castle in the Corbières in the Aude département is comparable to most so-called Cathar castles, but entry is still free so no-one has an interest in encouraging you to visit. A bonus is that Aguilais in the Fitou wine growing area. The earliest building at this location belonged to the count of Fonnollède (Fennoullies) in 1021. In the 13th century, a keep that had replaced earlier buildings was bequeathed by the viscounts of Carcassonne to their vassal, the family de Termes. 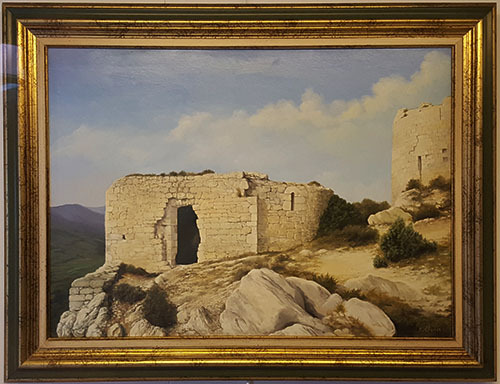 (there is another Cathar Castle at Termes not far away). In 1210 Aguilar was occupied by Simon de Montfort, whose soldiers had captured the owner Raymond de Termes and imprisoned him in a dark dungeon in Carcassonne. Militarily, the castle lay dormant for the next 30 years, until Raymond's son Olivier de Termes took back the castle in the brief revolt by the young Viscount Trencavel against the crusaders. Aguilar then became the refuge of faidits, Cathar knights and lords dispossessed of their own strongholds, but it changed hands again when the revolt failed. 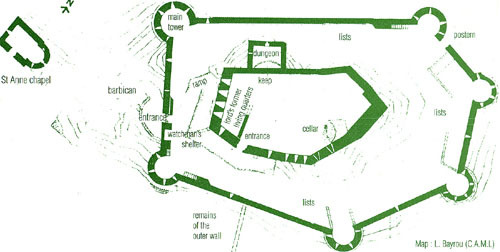 In 1246 a royal garrison was installed to supervise the Aragon frontier. Olivier made an alliance with king Louis IX, who purchased the castle from him in 1260. 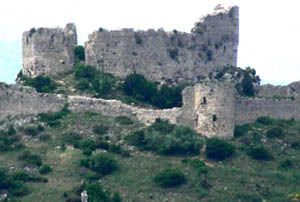 Despite the heavy fortifications, the castle would be continually under siege by opponents of French rule until the 16th century. 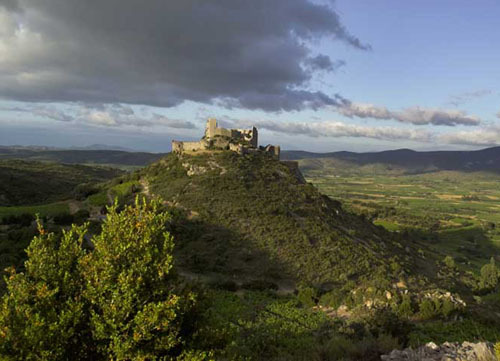 This is one of the "Five Sons of Carcassonne", along with Queribus, Termes, Peyrepertuse and Puilaurens: five castles strategically placed to defend the French border against the Spanish. It lost all strategic importance after the Treaty of the Pyrenees in 1659 when the border was moved even further south to its present position along the crest of the Pyrenees. The design of the castle reflects evolving military thinking of the late Middle Ages. It consists of an inner keep built in the 12th century, surrounded by an outer pentagonal fortification from the 13th century. It is oriented so that its point guards the side most vulnerable to attackers. 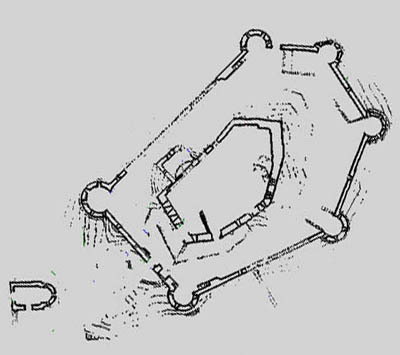 The keep and the inner hexagonal fortification is flanked at each corner by semi-circular guard towers, each with archery outlooks. 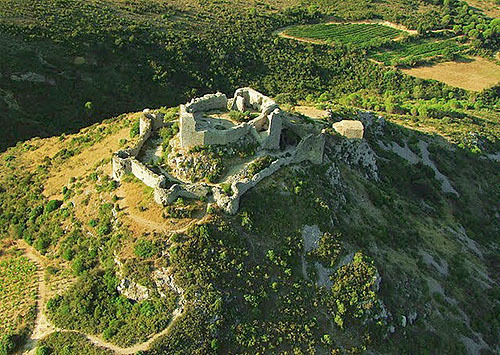 The strategic location of the castle on a hill overhanging the plain of Tuchan allows supervision of a significant area within the corbières. 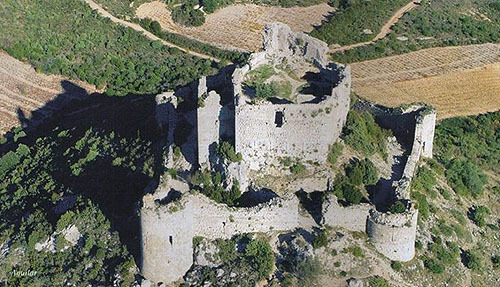 The castle is easily accessible from the plains because of its relatively low elevation of 321 metres. A small underground chapel of Saint-Anne can be seen below the keep. by Hervé Olivier, Oil on Wood.